Researchers have found more than 300 chemicals in the umbilical cord blood of newborn babies, rendering them pre-polluted even before birth. At the start of Breast Cancer UK’s Prevention Week ion 2018, a new report from Giki Social Enterprise showed that while chemicals connected to health issues are common in beauty and children’s products, they are also avoidable. Giki analysed more than 4900 products across 230 brands to assess whether or not their products contained chemicals of concern. ‘What’s hiding in your beauty products?’ aims to help address concerns of many consumers, scientists and NGOs regarding exposure to chemicals in everyday products. 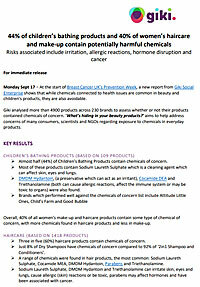 Almost half (44%) of Children’s Bathing Products contain chemicals of concern. Most of these products contain Sodium Laureth Sulphate which is a cleaning agent which can affect skin, eyes and lungs. Cocamide DEA and Triethanolamine (both can cause allergic reactions, affect the immune system or may be toxic to organs) were also found. Brands which performed well against the chemicals of concern list include Attitude Little Ones, Child’s Farm and Good Bubble. Overall, 40% of all women’s make-up and haircare products contain some type of chemical of concern, with more chemicals found in haircare products and less in make-up. Three in five (60%) haircare products contain chemicals of concern. Just 8% of Dry Shampoos have chemicals of concern compared to 92% of ‘2in1 Shampoo and Conditioners’. Sodium Laureth Sulphate, Cocamide MEA, DMDM Hydantoin, Parabens and Triethanolamine. Sodium Laureth Sulphate, DMDM Hydantoin and Triethanolamine can irritate skin, eyes and lungs, cause allergic (skin) reactions or be toxic. Parabens may affect hormones and have been associated with cancer. Urtekram, Roots & Wings and Organic Shop consistently performed well, with none of their products containing chemicals of concern. Almost three quarters (71%) of women’s make-up (Blushers, Lipsticks and Glosses, EyeØ Make-Up and Foundation) is free from chemicals of concern. The most common types of chemicals of concern found in make-up products include BHT, Parabens and Ethylhexyl Methoxycinnamate. While BHT can irritate skin, eyes and lungs and may be toxic to organs, parabens andØ Ethylhexyl Methoxycinnamate are both associated with endocrine disruption. Burts Bee’s, La Roche-Posay, Miss Sporty, Bourjois, Rimmel London and George (Asda)Ø performed best. Very few brands produce an entire range which is free from chemicals of concern. What Are Chemicals Of Concern? Understanding the ingredients list on most cosmetics is difficult for the vast majority of people. Not only are the terms often highly scientific but there are also a large number of terms to understand. Whilst the amount of exposure, the length of exposure, other factors and uncertainty make it almost impossible to determine a direct link to issues from skin irritations and allergic reactions to links to cancer, hormone disruption and effects on the reproductive system, many consumers take the approach that they would rather not take the risk. As a result Giki has compiled a list of commonly cited chemicals of concern using a number of sources. These are the Campaign for Safe Cosmetics (a US based not-for profit), Breast Cancer UK (#ditchthejunk) and the David Suzuki Foundation (a Canadian charity). This list can never be fully comprehensive or complete so consumers should always check the label if there is a particular ingredient they are concerned about. Giki’s algorithms read the product label looking for the chemicals and, if none are found, a product is awarded a No Chemical of Concern badge. Giki, a social enterprise, was founded in 2017 to encourage sustainable consumption by inspiring people to make small, regular changes in their supermarket shopping which are good for them, better for the environment and fairer to other. In addition, Giki conducts research on key consumer issues to try and help people understand more about the products they buy and the companies they buy them from.